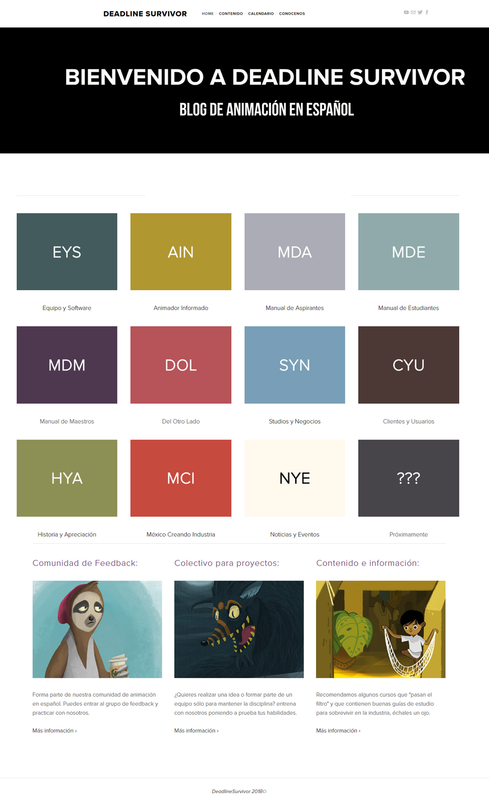 Deadline Survivor is an animation blog in spanish about the animation industry in Latinamerica. The illustrations were made by talented Mexican artists. The two owls, which are the mascots of the brand, were made by Nijah (Piñatha) under the pattern of colors established by the branding. The other illustrations were not made for Deadline Survivor but were borrowed by recognized Mexican animators to dress the blog (Carlos Mejía, Quique Foyo and Salomón Duarte) with their permission, of course. To avoid making Motion Graphics videos, animated gifs with invitations were made. This will change from 2019 since the site will be relaunched. One of the problems to solve was the number of categories that the blog has. With a strong “mystery” campaign in social media, these initials are intended to be part of the brand. When you click on each one, it takes you to a different category of the blog. The categories have their own branding because they represent each of the members of the animation industry such as: students, teachers, animators, artists, producers, technical animators, investors, etc. The user experience in this blog is really important. The calendar is one of the most important features in this website. It is a calendar for animators to prepare the next-year demo-reel. The calendar is connected with the calendar in the Facebook Group and all the members of the group should to the challenge in two weeks or less and present it for the rest of the members to get feedback. A free advertising page is expected, so the experience with banners is never interrupted. In the content, the Deadline Survivor twitter messages appear as well as the invitation to subscribe but there is no advertising.